This recipe is full of nutrition thanks to chickpeas, spinach, tomatoes and antioxidant-rich spices. Let’s take a look. 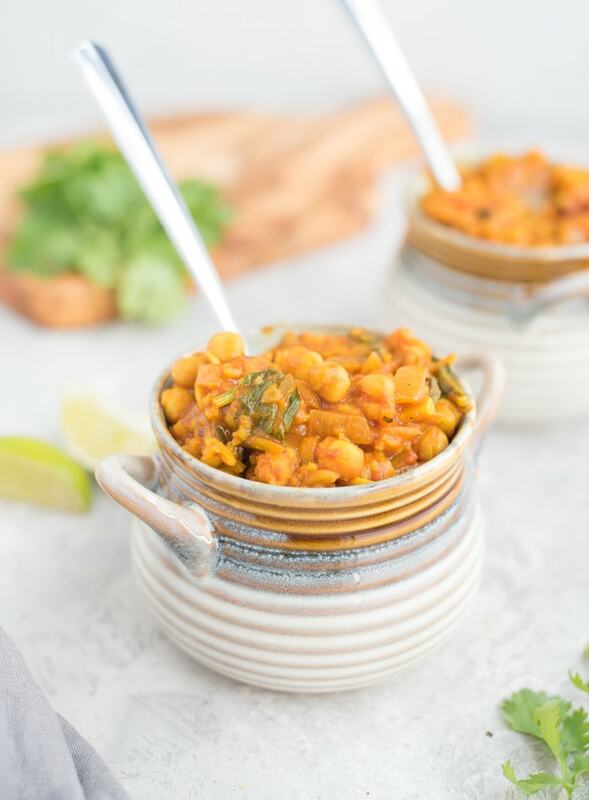 Chickpeas, or garbanzo beans, are an excellent source of fibre, folic acid and manganese and contain iron, magnesium, folic acid, copper and zinc. Eating a diet rich in fibre can help lower cholesterol and improve blood sugar levels. Regularly eating legumes such as chickpeas is a good way to cover many of your nutritional needs on a plant-based diet. 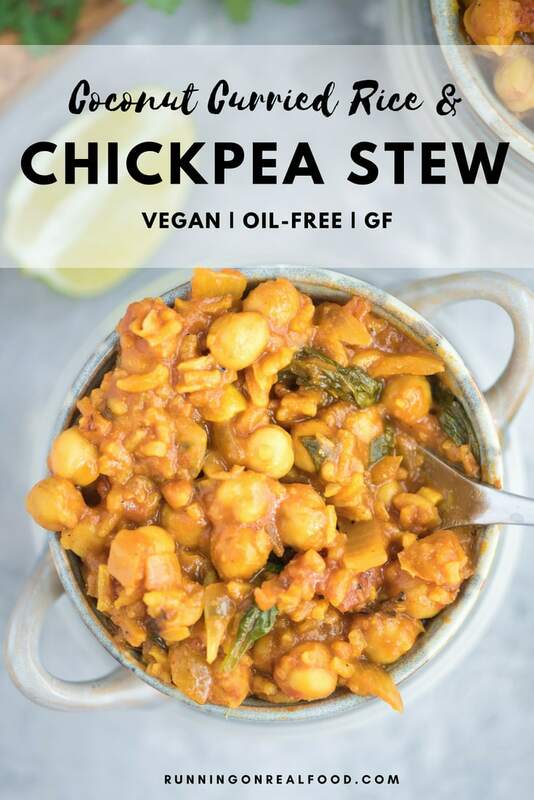 Thanks to the chickpeas, this recipe contains 13 grams of plant-based protein and 9 grams of dietary fibre per serving. Tomatoes are rich in fibre for a healthy digestive system and a good source of cancer-fighting antioxidants. Tomatoes contain a large amount of lycopene, which ahs been shown to defend against various types of cancer. They’re also high in vitamin C, vitamin A, iron, vitamin K and potassium. Vitamin K is essential in blood clotting and potassium is essential for maintaining healthy nerves and normal blood circulation. If you can, I would recommend organic tomatoes as tomatoes are one of the most highly sprayed crops in the world. I used these organic fire-roasted diced tomatoes. I love sneaking dark, leafy greens like spinach and kale into recipes to boost the nutritional benefits. Did you know as far as whole foods go, that dark leafy greens offer the most nutrition per calorie than any other food? According to How Not to Die, eating greens nearly everyday may be one of the most powerful steps you can take to prevent disease and prolong your life. In addition, a team of Harvard University researches analyzed all food groups and found that greens turned out to be associated with the strongest protection against major chronic illnesses including up to a 20% reducing in heart attack and stroke for every daily additional serving. So sneak those greens in when you can. For more easy ways to eat more greens, try my kale spinach smoothie, Vegan Spinach Pesto, Kale and Chickpea Stir-Fry with Miso Peanut Sauce or Roasted Chickpea Kale Salad. In addition to all that, the spices, garlic, ginger and onions all add their own range of vitamins, minerals and antioxidants. 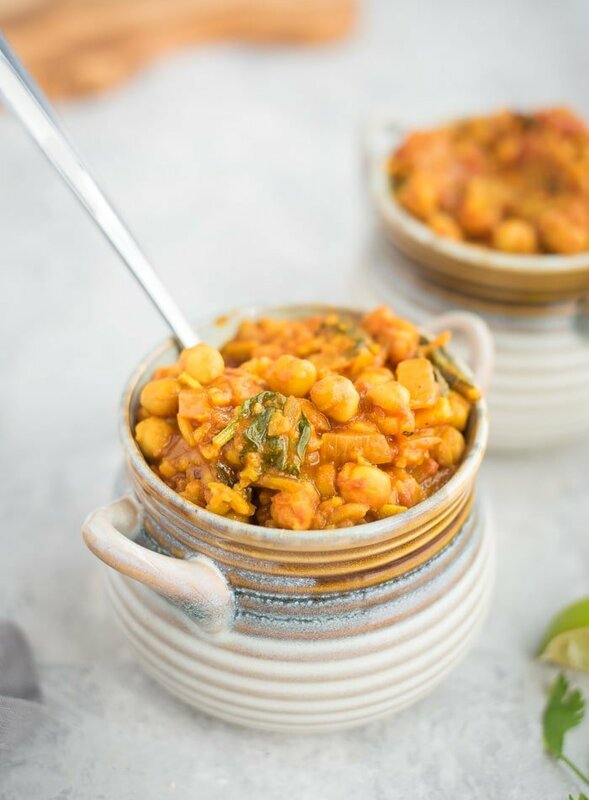 Enjoy this hearty, cozy chickpea stew during the colder months to boost your immune system and warm up on chilly days. This chickpea curry recipe comes together in under 30 minutes with minimal prep work and effort. Just chop some onions, garlic and ginger, open some cans, toss it all in a pot and simmer away until the rice is cooked. At the end you’ll stir in 10 ounces of spinach to finish it off. It’s a good recipe if you’re looking to clear out your pantry and put some of those canned goods to work. Plus, the flavours of this recipe only improve the next day so it’s well-suited to be made in advance. You can store it in the fridge for up to 5 days or in the freezer for up to 3 months in a sealed container. This recipe makes 6 entree-sized servings of 400 grams each. One serving provides 310 calories with 53 grams of carbohydrates, 13 grams of protein and 6 grams of fat with 9 grams of dietary fibre. You’ll also be getting 25% of your daily iron, 15% of your daily calcium, a full day’s worth of vitamin A and 35% of your daily vitamin C. This recipe is also rich in folate, magnesium, B vitamins, copper and phosphorus along with a range of antioxidants and phytonutrients. 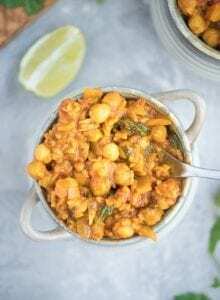 This cozy, hearty chickpea curry is warming, comforting and just perfect for Fall and Winter. This recipe takes less than 30 minutes to make, is packed with nutrition and keeps well for healthy meals all week. Sauté the onion, ginger and garlic in the olive oil for 5 minutes over medium heat. Add all the spices and continue cooking for a few more minutes, stirring. Stir in the diced tomatoes with their juice, chickpeas, coconut milk, vegetable stock and jasmine rice. Stir in the spinach and lime and mix well. Simmer 5 more minutes. Remove from heat and serve topped with fresh cilantro. Chickpeas are my most favourite thing to eat. This looks a really lovely recipe. I will be pinning this. Thank you for sharing. My mom passed down her “get there super early” traits to me. I am the one who gets to there 8am lecture at least an hour before 😛 I can’t be late! How many onions ate required for this recipe and how should they be prepared- chopped? Been following your blog/recipes for 2 months now. Thanks. It says 1 onion in the recipe. I imagine they need to be chopped small to mix well with the rest of the ingredients. This looks delicious! 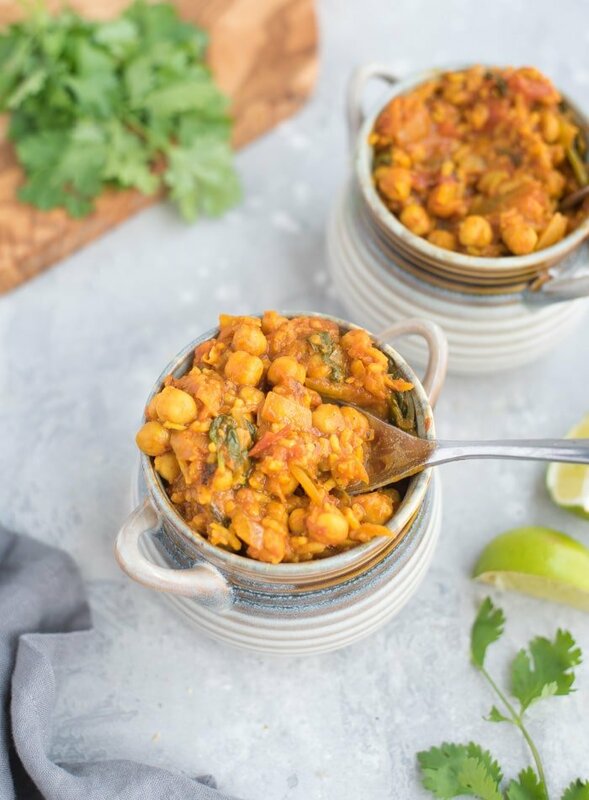 I love chickpeas because they’re so filling and versatile! Yesss, please. 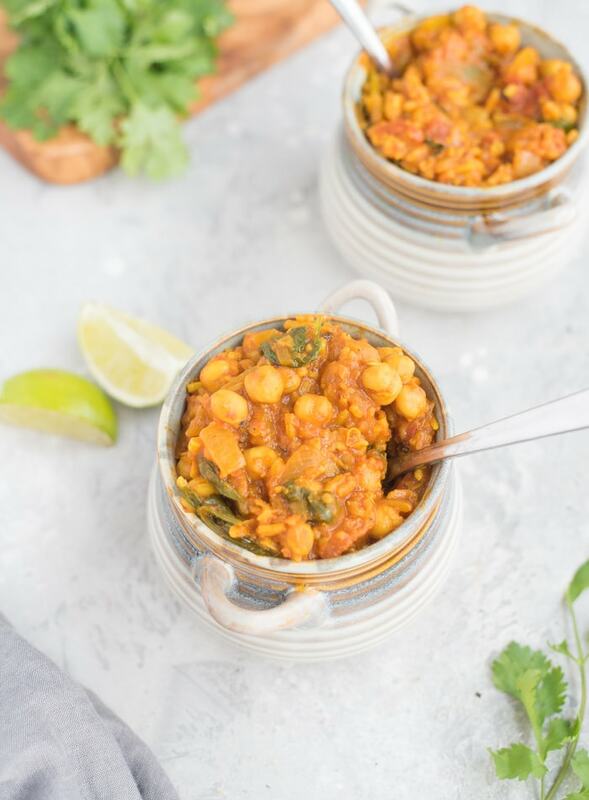 This contains all of my favourite ingredients – chickpeas, lots of Indian spices, coconut. Even though I’ve yet to try this particular dish I agree it might very well be happiness. Or at least really delicious. And this look delicious by the way! Ohhhh I love the combination of flavors here! And yes- I totally agree. One pot meals are the best! I live in a house with a bunch of other girls, so there’s often a lot of dishes/people in the kitchen. It makes it hard to clean up! For a second I thought this was from a new Isa book. May want to fix your source. I haven’t but it should be no problem to freeze for up to 3 months in an air-tight freezer safe container. Let me know if you try freezing! This looks amazing! I was thinking of maybe using quinoa instead of rice? Would that work out? Made it and it was FANTASTIC! Thank you!!! Awesome!! So glad to hear you enjoyed the recipe! Thanks for letting me know.